The main hall of Shanghai's Jade Buddha Temple started the monolithic moving project on Saturday. After two weeks, it will be moved 30.66 meters northward and raised 1.05 meters for security considerations. The temple, built in 1882 and named for two jade Buddha statues shipped from Myanmar, has been one of the most popular religious venues in Shanghai, with 1.5 million visitors a year, a third of them from abroad. On special occasions such as Chinese New Year's Eve or Buddhist festivals, visitors can top 100,000 per day, as people go to the temple to burn incense and pray, leaving the all-wood structure at risk of fire and crowd-related problems, including stampedes. 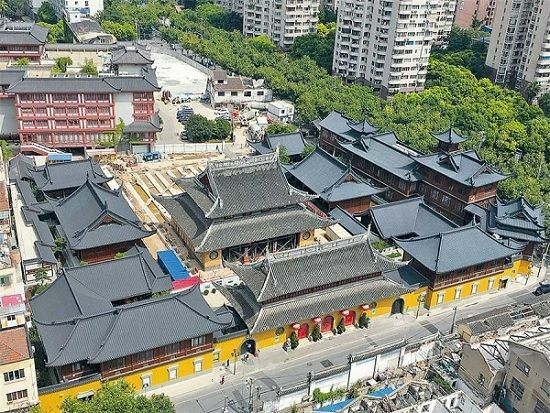 After the relocation, the size of the open square in front of the main hall, where most visitors gather to burn incense, will be doubled to almost 1,000 square meters. Relocation of the main hall is part of the renovation launched by the temple in July 2014. All the statues and relics inside 750-square-meter hall will remain in place during the relocation, which is unprecedented in the country and definitely the most challenging task of the three-year renovation.